The Department of Agriculture’s Bureau of Agricultural Research (DA-BAR) is eyeing the sweet potato or kamote as an important feed source for the aquaculture industry. Funded under the National Technology Commercialization Program (NTCP) of the BAR, a project titled “Technology Commercialization of Protein-Enriched Sweetpotato as Feed for Aquaculture Bureau of Agricultural Research (BAR), is being conducted by the Tarlac College of Agriculture (TCA). The study mainly is to assess further the potential of the crop, including its commercialization to provide fishpond operators or owners with affordable and high quality feed formulation for aquaculture specifically in bangus, crabs and prawns, BAR said in a statement. The research is currently underway with the fishpond operators in Central Luzon and neighboring provinces as collaborators, and is headed its program leader, Dr. Rodolfo Domo-os, with Dr. Ma. Teresa S.J. Valdez and Dr. Manuelo Agsaoay as collogues. According to BAR, the restrictive cost in feeds is a main discouraging many operators in the aquaculture industry, adding that animal nutritionists all over the world are constantly searching for the dietary protein sources of fish to maximize growth and increase production within the shortest possible time and at lowest cost. “Initial studies conducted by TCA with the protein-enriched sweet potato (PESP) was done through fermentation which paved the way for the production of inexpensive, high valued aquafeeds,” the agency said. 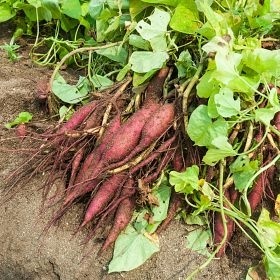 According to BAR, employing fermentation makes use of beneficial microbes, resulting in a 17 times more protein content of sweet potato pulp “after enrichment by fermentation was achieved,” which can replace a percentage or even entirely, the expensive and sometimes seasonally unavailable conventional feed ingredients. Sweet potato chips were ground and fermented following the procedures employed in protein enrichment pulp. A standard nutrient solution with some modifications was prepared. After two weeks of fermentation, the potato chips are sun-dried to remove much of the offensive odour and can remain fresh up to two years without adding anti-oxidants. To showcase the technology, several fish ponds were fed of PESP to bangus, tilapia, crabs and prawns, and were compared with the fishpond operators’ practices. “All feeding trials in commercial ponds were done for the entire grow-out period until the bangus, tilapia, crabs, and prawns were ready for harvesting,” BAR said, adding that the agency asked the help of fishpond operators in Malolos, Bulacan; Balanga, Bataan; Dagupan, Pangasinan; and Iba, Zambales, through participatory feeding trials. According to BAR, the PESP is considered a breakthrough in aquafeed Industry, necessitating a protection by a trademark for a period of 50 years. The TCA, with the help of BAR, will establish a feedmill and engage into the mass production and marketing of the product to better serve fishpond operators in Pangasinan, Bataan, Zambales, and Bulacan, according to the agency, and added that the project also hopes to commercialize the product involving private investors for operation to put-up their capital shares in this venture. According to Dr Agsaoay, the cost of production is reasonable and can be mass produced in a village level through technology transfer agreement, with a kilo of PESP at P12.25 or P 612.50 for every 50-kilo bag. Initial feedback from fishpond operators and the fishing communities showed positive response. Big-scale fishpond owners have appreciated the effects and potentials of the feeds as a viable substitute to commercial ones.